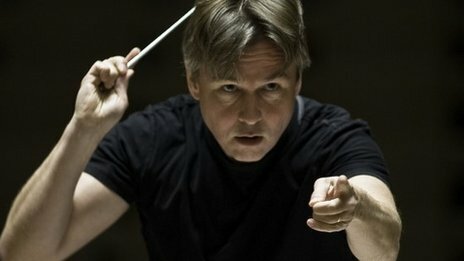 Esa-Pekka Salonen is the principal conductor of the Philharmonia Orchestra in London. His career took off when he stood in at the last minute for a sick conductor when he was just 25. Almost 25 years later, he was recently named conductor of the year. I think the most important thing is passion, you really have to love the music. You have to love the music more than you love yourself in a way. I didn’t have any great dreams of conducting as a kid but I loved music for sure. I was highly suspicious of conductors, they seemed to be attention grabbing people who looked kind of disgusting with their combed hair and unreal clothes. But when I started, it was something that came quite naturally to me and I discovered that I rather enjoyed it. So it wasn’t a childhood dream that finally became a reality, it was more like going with the flow and lots of seemingly random events. You have to train as a conductor to be one. Get into one of the conducting classes at a college or a music academy. Even before you do that, the best education for someone who wants to become a conductor is to sit in rehearsals. That’s where you learn. A concert is just a concert, that is when we deliver what we achieved in rehearsals. To know how to get to that point you have to witness the process. Most people start quite early and they start by learning to play an instrument. It is unimaginable to be a conductor without being able to play something well. It doesn’t matter so much what you play, it can be the piano or the bagpipes, but you have to know what it means to play something well. Otherwise you will not be in a moral, mental or ethical position to demand the same thing from an orchestra. That’s really important. The composer is the chef and conductors are the waiters. Both are totally honourable professions but we have to accept that if I conduct a piece by Beethoven, I’m just a waiter. I might be head waiter, but waiter none the less and I am there to make sure the food comes to the table on time and intact. Ranting and raving and scaring everybody doesn’t work in my opinion. The conductor as a lion tamer/policeman/ kindergarten teacher/priest is no longer necessary. It’s about being able to focus the thoughts and ideas of a large group of people and enable them to achieve the desired artistic result. I don’t think thick skin is a good thing to have in this profession. On the contrary you need to be sensitive, you need to be able to feel the vibes of an orchestra on a human level to be able to pick up what’s going wrong. Conducting can be quite hard work. If someone who wasn’t used to it tried to stand up and hold their arms above their shoulders for two hours, I think most people would faint. We eat out all the time after concerts too and we eat late, so it’s easy to over indulge. I try and stay in shape so I run. Exercise for me is a mental experience, it’s my own time. Sometimes after a week or two you can feel like you have totally exhausted your social capabilities, at which point to be totally alone is fine to recharge. It takes a lot of energy to keep a large group of people focused. I get all my conducting sticks in [Harry Potter’s] Diagon Alley. No, not really, all by batons are made by a third generation stick maker in Tokyo. His grandfather started the business and he made batons for some great conductors. There is nothing magical, it’s just wood, but if you are going to hold this piece of wood in your hand for hours and hours every day for years you get very specific about how it must feel. It becomes a part of you. I went to Tokyo just to meet Mr Moriotso. There were huge shelves with rows of little coffins containing sticks. Mine were so high up he needed a ladder, I ordered three cases of the same one. I think the biggest danger for young people is to do too much too soon. Make little excursions outside your comfort zone daily or at the very least weekly, otherwise you will stagnate and that would be a mistake. Find the balance between safety and danger. You cannot exist in the danger zone but also shouldn’t exist solely in safety and that is without any exceptions. It is OK to take your time. Being a Finnish person, things can be quite slow so it took me seven years to talk to my wife for the first time. We’ve been married for 22 years now, so it was worth the wait. I think it’s so important to engage in these things. Why would we be any different to other art forms? Why wouldn’t we have to engage with our audience? That’s one of the problems that classical music has had, we think we are the mountain to which everyone else has to come. I cannot assume that people automatically want to come to a concert, listen to something written 200 years ago, performed by people wearing clothes from the 1880s, conducted by a man or woman making ritual movements that seem to be vaguely connected with what is going on. Our duty is to communicate to the world and let people know what we are doing. It is an arrogant and stupid thought that classical music should somehow exist in a bubble. The gender of a conductor is of no importance anymore. The musical world is perfectly open and willing to embrace female conductors. There is no reason for girls not to go into conducting. The business is ready and I know from experience there are no reasons why female conductors can’t be just as good if not better than male ones. We are ready. This entry was posted in About Brendan Ball and tagged 10, a, advice, barrington, BBC, become, conduct, Conductor, conductors, drowning, esa, how, instruction, interview, lev, manual, news, not, orwell, parikian, pekka, salonen, ten, tips, to, waving. Bookmark the permalink.